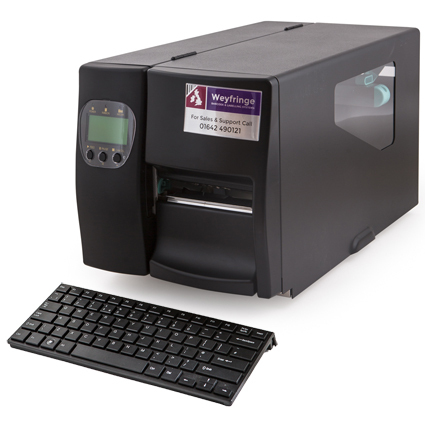 As manufacturers and distributors of barcode & label printing systems Weyfringe have off the shelf solutions to meet most labelling requirements. We can also tailor solutions to meet your bespoke requirements. Some examples of these solutions are below. The customer had a large warehouse and required many people to be able to print product labels without purchasing multiple software licenses and PC’s. Weyfringe configured a Terminal Server version of Easylabel. This labelling software solution allowed almost unlimited approved users to access multiple labelling stations using only a single licence copy of Easylabel. Label selection and variable data is entered using portable or fixed devices for maximum flexibility. The customer was having recurring issues with operators selecting/applying the wrong product labels. After assessing the manufacturing process Weyfringe devised a closed loop solution taking barcode data direct from the customers production schedule and using it to directly drive barcode label printers according to the relevant product type. Single or multiple barcode scans can be used to produce merged data barcode labels when required. This combination of industrial barcode reader, high speed barcode label printer (with or without integral label dispenser) has resulted in ongoing accurate labelling. This solution removed operator input errors and speeded up production and was so successful the customer rolled it out across multiple sites. The customer wanted to control label printing for multiple production sites from one central location. Easylabel Net Print Server. With Easylabel Net Print Server the customer was able to log in to Easylabel over the internet and remotely control multiple label printers. This control extended to both label design and print ensuring integrity of label data and production. The customer wanted all the barcodes on products travelling on the production line conveyor checked for validity but did not have the time or resources to check every barcode by hand. 4. Alarms if any of the above checks fail. Alarms can be audible and visual with an option to send a conveyor halt signal. The customer uses the Barcode Checker 3 to complement their static barcode verification devices for increased monitoring and protection against non-conformance. The customer wanted to produce varying volumes of labels on demand and speed up the application of twin labels to the same product. Weyfringe supplied Easylabel Gold and a H436 printer configured to automatically peel and dispense labels ready for the operator to apply. Lower cost labels in 'twin sets' were also supplied to assist the process. Printed two across the web the matched pair of labels were simultaneously peeled and presented to the operator for application. Printing labels in house reduced costs and directly dispensing the labels as they were printed in pairs resulted in improved application speeds and reduced the possibility of mis-pairing. 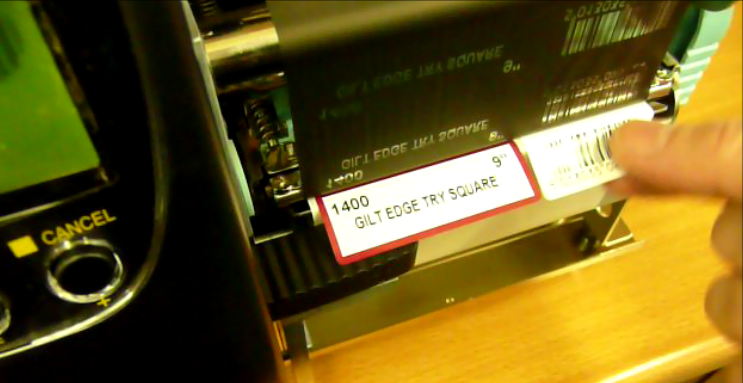 The customer wanted to print barcode labels in a production environment not suitable for standard PC's but does not have the budget for an industrialised computer. 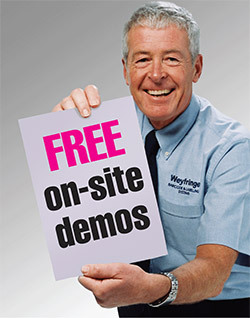 Weyfringe supplied a handheld keyboard which directly link to the Weyfringe H Series printer and uses the printers built in display to communicate with the operator. The keyboard can be supplied with a dust and splash proof cover but is low cost so any occasional crush or immersion is not significant. Even though no PC is attached multiple label designs can be selected and printed and variable data added to the printed label by virtue of the H Series printers built in protected memory and comms capability. The customer wanted to source multiple printers to be rack mounted in the minimum amount of space yet still have easy access to change the labels and ribbons. Weyfringe configured their CAB A4+ printers with bi-folding covers allowing the cover to be raised within half the space usually required. A world renowned manufacturer of ammunitions required highly accurate label identification of their product type with technical details to be automatically printed and applied to cartons, but could not provide the usual required access to the target apply zone. Weyfringe overcame the access restrictions to meet the customer's requirements by engineering a bespoke pneumatic label transfer module to transport the label from the Weyfringe DB4 system through the restricted access zone and apply it to the carton. This solution improved labelling speed and presentation whilst avoiding complex reengineering of the production line layout. A legacy labelling system was not providing the customer with the flexibility or performance they now required. Time consuming multiple data entry requiring cross referencing by the operator was slowing production and not providing sufficient data security. Weyfringe provided access to a secure Access database direct from Easylabel Platinum software allowing data input to be automated by scanning 2D (2 dimensional) barcodes. Data was thus reliably accessed and transferred to the Weyfringe label printer, where it was printed and automatically peeled and dispensed to the user for easy application to the product. The customer wanted to create a barcode data log of every products barcode to record any failed or incorrect barcodes. This log would be used for their barcoding continuous improvement program. For maximum understanding the date and time of any identified barcode problem was to be added to the data log. Rather than adding a PC to the Barcode Checker solution and unnecessarily increasing the overall cost or complexity Weyfringe suggested building in a custom barcode data logger unit to record every barcode number read, any barcode errors and the associated date and time. This data can be uploaded by the customer when required directly into their process control system or Excel spreadsheet. The Weyfringe Barcode Checker solution performed well providing the customer with the data necessary to improve their barcoding performance and since the initial unit more have been supplied to cover the customers multiple lines.